This complicated book is one of my favourites that I have read in this genre. I enjoyed the characters with all their glorious flaws, and will definitely look for more of this author's work. It was well written and had some underlying plots that I didn't see coming. I really enjoyed this book quite a bit. I am not always a fan of books that feature dual timelines but this one worked really well for me. I ended up liking both of the timelines equally and thought that Lucy and Justine both had an interesting story to tell. This story was really focused on the characters with the plot building slowly. I found myself really invested in this group of characters by the close of the book. 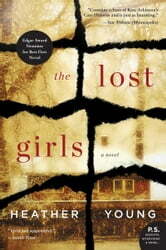 This book focuses on Justine and Lucy. When Lucy died, she left everything to her grandniece, Justine. Justine has two little girls and lives with her boyfriend in California but feels something missing in her life. When Justine inherits Lucy's lake house in Minnesota, she takes her girls and moves there in order to get a fresh start. The transition isn't as easy as Justine expects it to be. Lucy has her own story to tell and decides to write everything down before her death. When Lucy was a child, her younger sister, Emily, disappeared from the lake house and has never been found. Lucy's story tells everything that happened during the summer leading up to Emily's disappearance. Emily's disappearance was heartbreaking and shaped the lives of Lucy and her family. This book really showed how one event can impact a family for generations. Emily's sisters never really moved on with thier life after she disappeared. I liked watching Justine learn to take care of herself and really decide on what she wanted for herself and her girls. It takes a lot for her to learn to stand up for herself but I have a lot of hope for her by the end of the book. I would recommend this book to others. It was a book that gave me hope and broke my heart all at the same time. The slower pace was a nice change and I thought it really gave me a chance to connect with the characters. I enjoyed Heather Young's debut novel and look forward to reading more from this author in the future. I won a copy of this book from William Morrow via LibraryThing Early Reviewers. Wow! This book was so amazing and so unexpected. It had me guessing and on edge the whole book!